3 Bedroom Terraced House For Sale in Luton for Offers in excess of £220,000. 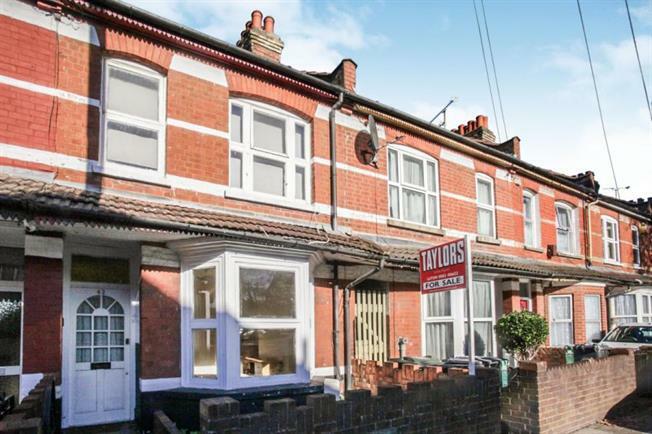 Situated along the popular Dallow Road overlooking a pleasant park within walking distance of Luton town centre and train stations is this spacious three bedroom chain free terraced home. The ground floor benefits from three reception rooms, kitchen/diner with access into the rear garden and a ground floor shower room. The first floor benefits from three well proportioned bedrooms and a second bathroom. This house would make a perfect buy to let investment either as rooms or a family home. Glazed wooden door, stairs rising to the first floor, laminate flooring. Bay window to the front, laminate flooring, radiator. Window to the rear, laminate flooring, radiator, understairs storage cupboard. Window to the side, laminate flooring, radiator. Floor and wall units, gas hob, oven and extractor fan, single sink unit, window to the side, tiled floor and walls, obscure door to the side. Two windows to the front, laminate flooring, radiator, fitted wardrobes. Window to the rear, laminate flooring, radiator. Shower cubicle, low level wc, pedestal wash basin, tiled walls and floor.